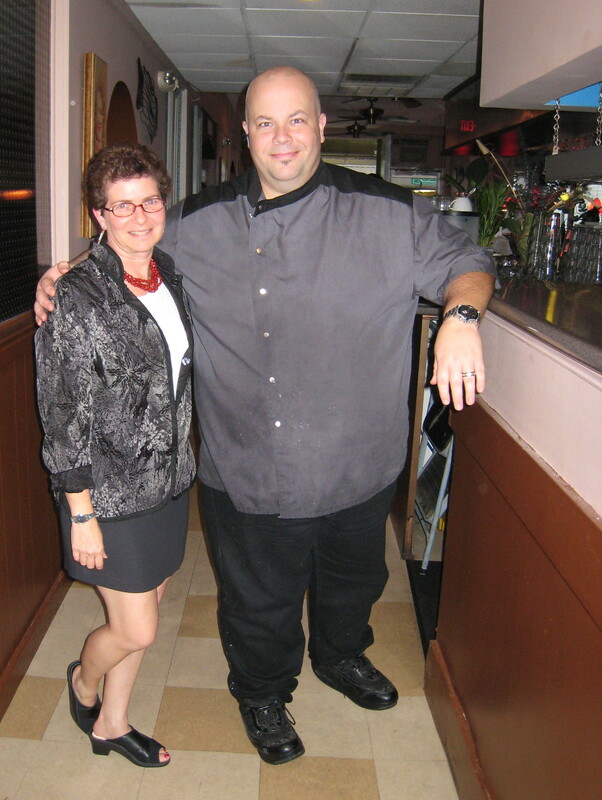 “We will seat everyone at one long table and serve dinner family style—just like Thanksgiving,” envisioned Chef Tony Marciante as we discussed final preparations for dinner. 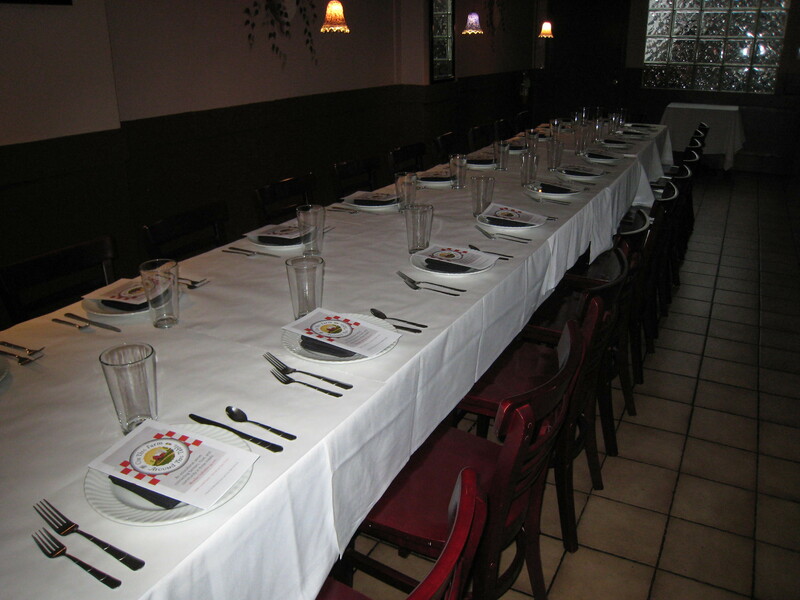 And what a festive event it was, as 28 guests dined together at Chef Tony’s Restaurant on Monday, September 19 in downtown Bethesda. Savor Local Flavor dinner was the finale of our three series event, On the Farm, Around the Table: connecting food, farmers, and community in three meals, hosted by Bethesda Green and Full Plate Ventures. The early autumn menu started with two appetizers–Cherry Glenn Goat Cheese variety served with fresh figs and a Balsamic vinegar reduction and an array of Carolina Gold and Red tomatoes with basil. Huge platters of pan-seared Virginia rockfish and chicken scaloppini followed with more platters of couscous ringed with tiny cubes of roasted beets, baked spaghetti squash, and a medley of tomatoes and zucchini. Just when we thought we couldn’t eat another bite, Tony served a warm Honey-crisp apple and peach cobbler with vanilla ice cream for dessert. Second, because our local food system is still nascent and has many gaps, we wanted to begin to connect stakeholders with one another. We introduced buyers to producers in the series— by visiting the Bethesda Central Farm Market, touring of Rocklands Farm, and introducing chefs to farmers. The series also connected businesses with one another—farmer Shannon Varley found new sources of animal feed, growingSOUL’s Jessica Weiss found a lead on land for her food composting operation, and a photographer scouted out her next subject—a farm in the Agricultural Reserve. Montgomery Countryside Alliance’s Land Link, connecting farmers with affordable available land. An increasing number of producers who are farming more sustainably—raising pastured poultry, grass-fed meat, building soil, and protecting our waterways and our health. Emerging National and local models of aggregation and distribution systems called—food hubs or value chains, such as The Food Hub in Charlottesville. 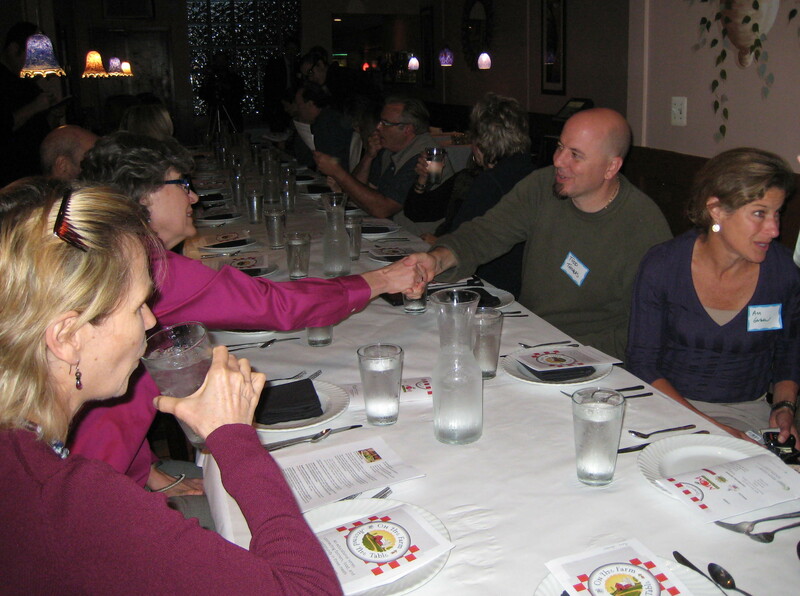 Join non-profits to keep abreast of local food issues and opportunities: Bethesda Green, Montgomery Countryside Alliance, growingSOUL, and SlowFood DC. Participate in Food Day-Oct. 24, spearheaded by the Center for Science in the Public Interest with local activities throughout the U.S.
Support businesses that walk the talk. 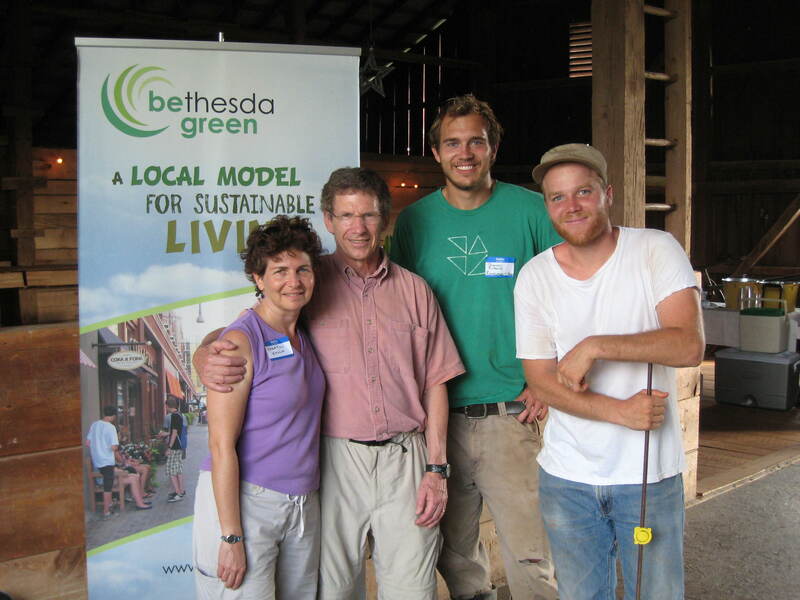 Bethesda Green and Full Plate Ventures gratefully acknowledge our supporters, including MOM’s Organic Market, Chef Tony’s Restaurant, Norman’s Farm Market, Johns Hopkins Center for a Livable Future; and all of our contributing partners. Neither Hurricane Irene and power outages, nor torrential rains, flooding and bridge destruction could cancel Fertile Ground — the second in our educational and delicious series, On the Farm, Around the Table: connecting food, farmers, and community in three meals. 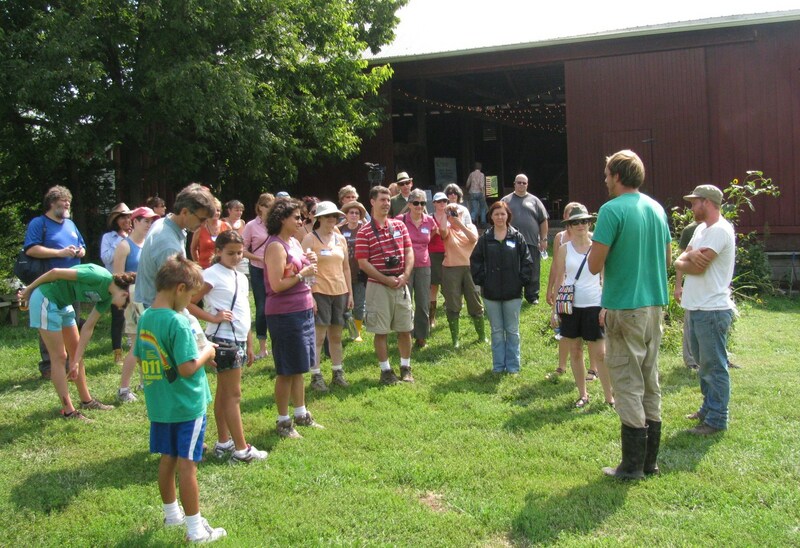 The rain stopped, the flooding subsided, and the sun shone brightly as 50 people gathered at Rocklands Farm in Poolesville on Saturday, September 10 to enjoy our local farm tour and lunch. Picking berries at Homestead Farm. The day started with a homemade lunch featuring Rocklands’ own grilled hamburgers, made from their grass-fed beef and artesian half-smoke sausages donated by MeatCrafters. Three side dishes celebrated summer’s bounty. Rocklands’ green salad accompanied homegrown and prepared pesto pasta with roasted red peppers, fruited grain salad with the season’s first Honeycrisp apples, and an adieu to summer with a peach and blackberry crisp for dessert. 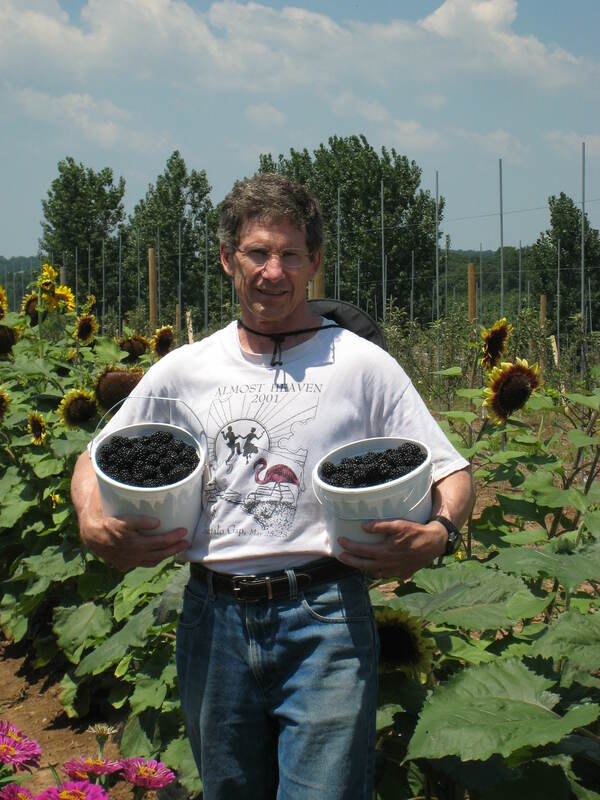 The blackberries were handpicked at their peak ripeness in July at Homestead Farm and frozen along with August’s basil and garlic harvest made into pesto. Both were in jeopardy of spoiling when Hurricane Irene knocked out power for several days and we scrambled to find a working freezer. Bethesda Green’s extra freezer saved the day. Only in their second year of farming at Rocklands, owners Greg Glen and Shawn Eubank not only grow food close to home — Rocklands is only 35 minute drive from Bethesda — their wholistic farm practices actually improve the soil while raising their animals humanely. Greg talked about how important soil fertility and grass management is to the success of raising grass fed beef and pastured poultry. He works with the animals’ natural behavior and precise timing of rotational grazing to manage their production. Starting the tour of Rocklands Farm. Rocklands’ beef cattle graze on pasture within moveable fencing until they eat the grass only to the point of recovery. The cattle are moved on to the next patch of pasture while Greg brings in chickens several days later to do what chickens do best, scratch and search for grubs and insects. In doing so, they spread cow manure and feast on the fly larvae that hatch from the cow pies. The soil is fertilized, the grass recovers and it is ready to begin the cycle again. Meanwhile their flock of 150 the chickens lay eggs — about four per week per hen during light seasons of the year. Their coup is actually on wheels — this chicken mobile is moved in rotation behind the cows. Event organizers Cheryl Kollin, Bill Franz, Shawn Eubank, and Greg Glen. fertility with compost — they are still perfecting on-site production, and by planting cover crops like nitrogen-fixing legumes and buckwheat, that return nutrients to the soil for the next crop cycle. They plant a large variety of vegetables, some so unusual that their customers don’t know what to do with them. “It’s a matter of introducing a new food to our customers. Once they taste something, we don’t need to do a hard sell,” explains Shawn. Rocklands has a new cold frame, called a hoop house that extends the growing season so that they can start their seeds in February. After the tour, attendees were delighted to buy Rocklands eggs and meat as a delicious souvenir of their afternoon on the farm. Don’t miss dinner! The On the Farm, Around the Table series concludes with Savor Local Flavor — Dinner with Chef Tony on Monday, September 19, at 7 pm. Tony will feature a menu around seafood, artisan cheeses, local wine and whatever is fresh from the farm that day. For details and registration visit, On the Farm, Around the Table.